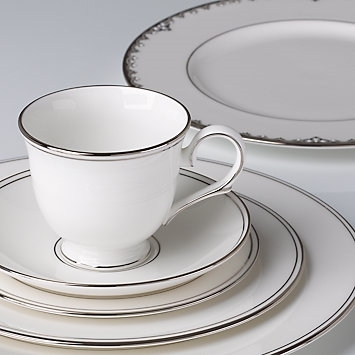 The Federal Platinum 5-pc Place Setting is the epitome of elegance. In pristine white china with double bands of precious platinum, this classic pattern will transform any table setting from ordinary to extraordinary. Each piece of dinnerware is distinguished by a footed stand, creating a beautiful presentation. Diameter of dinner plate: 10 3/4", salad plate: 8", bread plate: 6", saucer: 5 3/4"; capacity of teacup: 6 oz.